TRAVEL + FOOD Travel + Food — Craven + Co. Craven + Co.
I’m a creature of habit, so once I find things I like, I keep doing them. London is my favorite city in the world + I’ve gone every summer since 1996. It’s an ongoing joke with my friends who know that at the mere mention of London, I’ll trail off into how we should go and all of the things we’ll do when we’re there. At this point, I think they bring it up just to get me to repeat myself. I always walk away from a trip to London with new ideas for events. More than once I've had a little detail I’ve seen there turn into a full scale element for a Craven + Co. event. I find inspiration in stores, on the street, in restaurants. I know there are amazing little pockets all over London, but this guide will be about my well worn path of most loved spots. These are places and experiences I want to share and recreate with all of my friends back home. London has the best shopping in the world, in my opinion. One reason is that you can find some of the best designers you’ve heard of a million times right alongside designers you’ve never heard of before, and they are conveniently packaged in a few epic department stores that can keep you busy for hours. All of the stores have amazing home departments with displays that are an event designer’s paradise. One year, I saw this display in my favorite home store. We used this look of gorgeous individual leaves and clear glass vases for probably 20 events that we produced in the months following that trip. This chain mail placemat I saw Harrods is something I haven’t used yet but I have filed away. Harrods: Harrods is a sight to behold. As soon as you walk up to it, you know you’re walking into something magnificent. They have restaurants; a food court that is rumored to have literally any type of food you could ask for; any clothing designer you’ve ever heard of and many you haven’t; furniture; electronics; and a toy store that your child (and some adults) will never want to leave. They have a spa on the top floor with a hair salon, nail salon and a Moroccan spa. 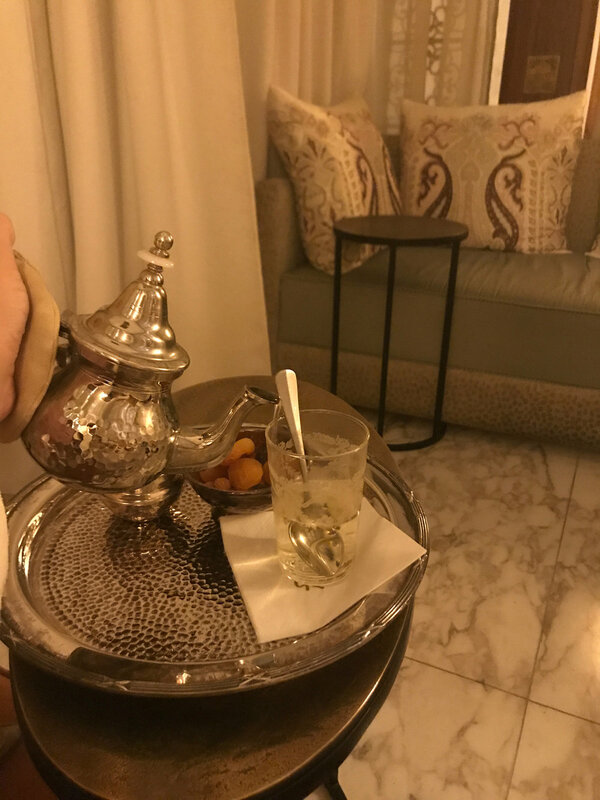 If you want a spa treatment you can’t experience many places, schedule a Hammam Ritual in the Moroccan Spa. It’s not for the very modest but it is unforgettable. Harvey Nichols: Harvey Nichols prides itself in highlighting up and coming designers, so it’s a fun place to explore. You still have designers you know but there’s always something new. They have a cute cafe on the top floor with a small rooftop bar that’s fun for a glass of rosé. Selfridges: Selfridges is on Oxford Street. 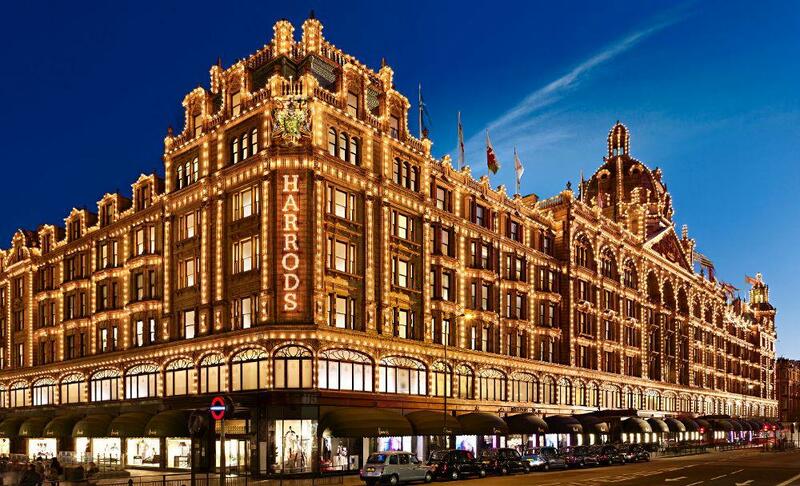 It is second in size only to Harrods, and it. is. incredible. It was created by an American named Harry Gordon Selfridge in 1908. He is credited with creating the shopping experience we know today, where the customer is always right and shopping is interactive. Masterpiece Theater has a series about him that you might like if you were a fan of Downton Abbey. Liberty: Liberty is on Regent Street, and is close to Selfridges. It’s a much smaller store but they’ve packed an awesome shopping experience into the historic Tudor building. 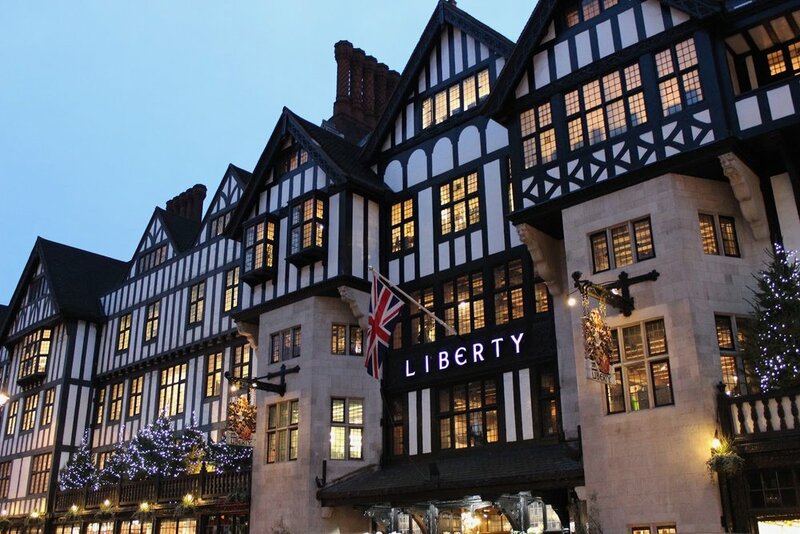 Liberty is known for having eclectic and traditional designers side by side. In the early days of the store's creation it was known for gorgeous fabrics for furnishings and clothing, and they still have a wonderful fabric department inside paying homage to their roots. 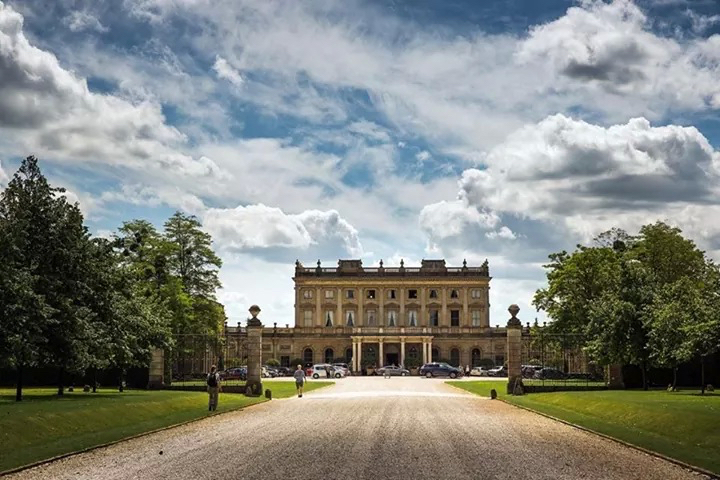 Most of the time I’ve spent in London has been in the city but I always spend one night at one of my favorite places, Cliveden House. It’s only about 30-45 minutes from London, and it puts you right in the middle of quintessential English countryside. The House is steeped in history, which I’ll let you read here. Each room is named after an important figure that has a connection to the House in some way. You literally feel like you’ve stepped into the set of Downton Abbey (which Cliveden makes a cameo in when Lady Mary gets engaged there). A night’s stay isn’t cheap, but absolutely amazing. Cliveden is also part of the National Trust, which means you can go as a day visitor and walk the grounds and still feel the magic. Cliveden is perched on a hillside overlooking the Thames and countryside. It’s so quiet, you could hear a pin drop, and with the way the House is laid out, you feel almost like you’re the only ones there. The restaurant is award-winning and was recently refurbished to make it even more stunning. They’ve also recently updated the guest rooms but have kept everything true to the history. In the city, I like to stay in Kensington or South Kensington because of the proximity to Hyde Park, Holland Park, Knightsbridge and Kings Road. If you like to walk, they are all within walking distance or a short cab ride. For years, my favorite hotel has been The Ampersand in South Kensington. The rooms are very well designed and modern. All of the spaces in the hotel feel cozy and playful with colorful palettes and cheerful staff. The restaurant and bar are also top notch. And even with all of that, it’s a good price for London. Carluccio's Cafe: This place has excellent pasta at a great price created by an old Italian guy (that happens to have a restaurant empire with locations all over the UK). They change the menu enough to keep it exciting but keep the same old favorites so that I’m never disappointed. They also serve small and large glasses of wine, which is one of my favorite choices to be given. The atmosphere is great for an adult lunch or dinner but they’re also accommodating for kids. 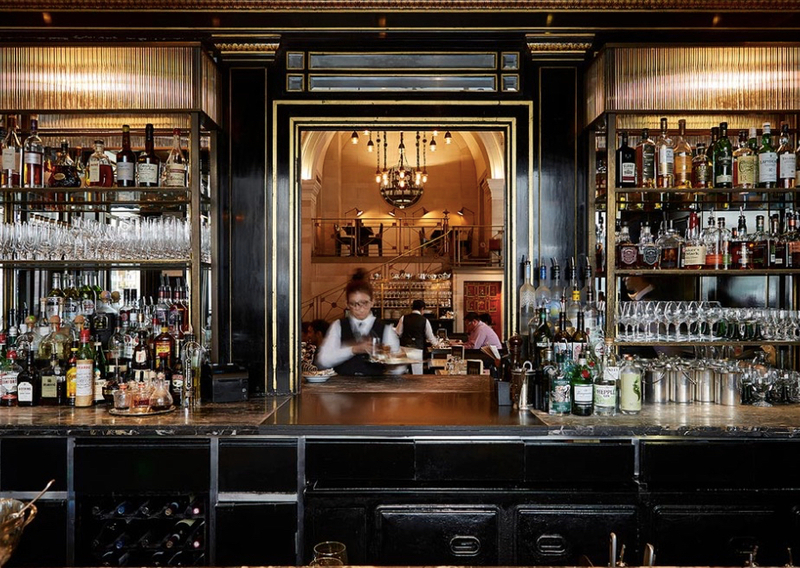 Bibendum Oyster Bar: The building that houses the restaurant is half the draw. It’s an old car garage from the 1920s. Bibendum is the formal name for the Michelin Man. It’s a great place for oysters and wine for lunch or dinner. There’s more to the menu, but the oysters are their shining star in my opinion. My favorite home store, The Conran Shop, is also housed in this beautiful building. Squirrel: Squirrel has bowls, salads and smoothies. The cute cafe offers counter service with a handful of tables. It’s quick, good and the price is right. Casa Brindisa: There is a pedestrian courtyard across the street from the Ampersand called Expedition Square. There are several casual restaurants lining the square. One of them is Casa Brindisa, a fun tapas restaurant. If the weather is nice, it’s fun to sit outside in the courtyard. Apero: This mediterranean brasserie is in the lower ground floor of the Ampersand Hotel. The food and cocktails are very well done, and they absolutely nail breakfast. The Wolsley: The Wolsley is located in Picadilly in a beautiful building that was originally built as a car showroom for Wolsley Motors in 1921. I’ve only gone for brunch and afternoon champagne tea, but I’m sure all of their meals meet their high standards. Cecconi’s: Cecconi’s is in Mayfair, and has a stunning emerald green, black and white interior. The food is impeccable Italian and the drinks and wine list are top notch. You definitely need a reservation to sit down for a meal. The bar is a scene, so it’s difficult to find a seat but sure is fun if you do! Daylesford Organic Farm + Cafe: This little cafe has awesome salads and other perfect lunch dishes connected to a shop with ready made food to go. Plus you’ll probably fall in love with some of their napkins, aprons and kitchen items and try to figure out how to fit them in your suitcase. Daylesford started as a farm in the Cotswolds but made it’s way into the city with a great response.